ANN and SPR Relationship. 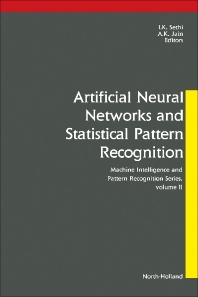 Evaluation of a Class of Pattern-Recognition Networks (L. Kanal). Links between ANN and SPR (P.J. Werbos). Small Sample Size Problems in Designing Artificial Neural Networks (Š. Raudys, A.K. Jain). On Tree Structured Classifiers (S.B. Gelfand, E.J. Delp). Decision Tree Performance Enhancement Using an ANN Implementation (I.K. Sethi). Applications. Bayesian and Neural Network Pattern Recognition: A Theoretical Connection and Empirical Results with Handwritten Characters (D.-S. Lee, S.N. Srihari, R. Gaborski). Shape and Texture Recognition by a Neural Network (A. Khotanzad, J.-H. Lu). Neural Networks for Textured Image Processing (J. Ghosh, A.C. Bovik). Markov Random Fields and Neural Networks with Applications to Early Vision Problems (A. Rangarajan, R. Chellappa, B.S. Manjunath). Connectionist Models and their Application to Automatic Sppeech Recognition (Y. Bengio, R. De Mori). Implementation Aspects. Dynamic Associative Memories (M.H. Hassoun). Optical Associative Memories (B.V.K. Vijaya Kumar, P.K. Wong). Artificial Neural Nets in MOS Silicon (F.M.A. Salam, M.-R. Choi, Y. Wang). Author Index.